I’m obviously very happy for the agreement, this official collaboration will allow Tatuus and Mugen to better respond to the requirements of teams which will participate in the Championships, providing a quality service for the purchase of cars and motors. I also thank Autotecnica Motori, which has concluded an agreement with Mugen in order to create a competitive combination. It is a common goal of expanding the combination Tatuus – Mugen in new markets. The driver Raffaele Giammaria will be in charge of development and testing and racing debut. The first tests were completed successfully in Vairano (Italy) on 10 and 14 May, covering 145 laps of the circuit handling (2.518 meters) and with high-speed straight test (2.000 meters). The PY-012 is probably the most radical and sophisticated CN Sports Prototype yet designed, and consequently I am extremely pleased and proud that MUGEN EURO was invited by Gianfranco De Bellis to collaborate with TATUUS via our new associate Autotecnica Motori in the optimisation of the K20 engine installation in the chassis and the provision of MUGEN race-prepared engines to TATUUS teams. The record of TATUUS as a successful racing car manufacturer goes almost without saying, and we know the ability of Giovanni Delfino’s company to prepare engines to the exacting standards set by MUGEN in all categories or racing. 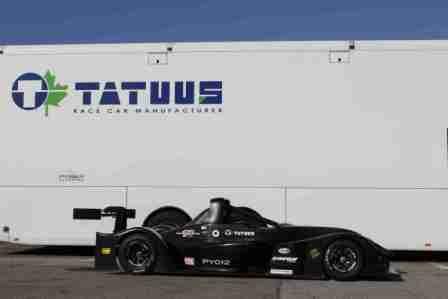 We are also confident in Autotecnica Motori providing with integrity a logistically convenient high-quality customer support and engine rebuild service for TATUUS teams. This 3-way alliance also enhances Mugen’s support for Honda Motorsport Europe’s backing of the SpeedEuroSeries, always an important aspect in our business and sporting strategy given Mugen’s longtime association with Honda and its motor racing activities generally. The TATUUS-MUGEN combination has great potential for development in European and overseas markets, and we are looking forward very much to working with our technical partners to achieve this. First however is to demonstrate the potency of the new collaboration in the forthcoming races! Nothing has changed regarding MUGEN EURO’s engine and parts supply and customer service to other constructors and teams. Engines race-prepared by MUGEN EURO for any customers will be of the same performance as the engines that we and AUTOTECNICA MOTORU are providing to TATUUS, the arrangement we have made is in the interests of accommodating the specific PY-012 engine installation and packaging requirements and of servicing TATUUS-MUGEN teams outside of the UK in the best way.